In the last five years, fashion’s impulse to comment on society has escalated to campaign-style politics, both on and off the runway: from the rapid rise of slogan tees, to the late Karl Lagerfeld’s feminist protest march for Chanel. This year’s Paris Fashion Week was just as polemic, with shows paying a clear homage to nature and the threat of climate change. This is a time to be proud of the fashion industry, and the way it can use its power and voice. Chloe, for example, reminds us what there is to lose. Creative director Natacha Ramsay Levi’s printed t-shirt features a young couple standing at the brink of a lake. He wears a check shirt, she wears a green parka, while they hold hands, looking wistfully out over an untamed mountain vista. As Rick Owens told the NYTimes: “I’m tired of thinking about doom and decline.” While his vision of life after the apocalypse was that of minimalism modelled by aliens, many of his contemporaries focussed on florals, reinventing a traditional trend with a futuristic twist. And so the message here emerged: in a world submerged by upheaval and technology, what could be more radical than retreating into nature? In Maria Grazia Chiuri’s feminist Dior show, textured, flower-bed maxi skirts made their entrance towards the end. The flowers are bold and unapologetic but the way they sit on mesh fabrics gives the impression that their foundations are disintegrating. 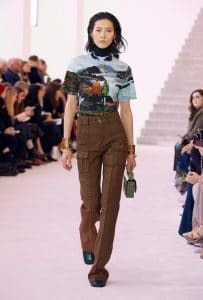 Miu Miu also mixes blooms with sheer fabric, and at Jacquemus, faded trousers with abstract, barely visible florals have the same effect – hinting at a fading natural world. 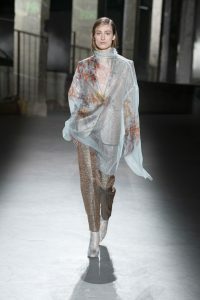 Dries Van Noten took inspiration from his Antwerp garden for his namesake brand. His carefully tended roses were picked and photographed for this FW 2019 collection. Yet the show’s atmosphere was melancholic; the soundtrack was Roy Orbinson’s haunting track ‘Crying’ and the focus was flowers’ flaws, not their beauty. The show evolved to echo the life cycle of a rose – and nature’s decline. First blackened, brown and wilted leaves appeared against bright purple fabrics. 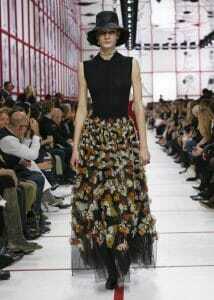 Then, the collection’s tone grew darker as florals appear against empty, ominous and barren backgrounds. Towards the end, another shift: flower motifs become glittering and holographic as the designer nods to a future beyond our damaged planet. Newcomer Marine Serre’s vision of a floral future was even more dystopian. Her collection, entitled ‘Radiation’, is set after the apocalypse. Between alien-like bodysuits (that covered faces, feet and hands) and black balaclavas, flowers briefly featured – like flashes of memory from a past life. Pink and beige floral inserts appeared alongside black lycra with the contrast making the flowers seem otherworldly; delicate preservations from life before catastrophe. The way Serre carries florals forward into her dystopia future is her hint that natural beauty can – and should – be preserved, especially in the face of upcoming apocalypse.